Compared to other US industries the rate of insolvencies is low in the machinery sector, and it is expected that business failures will level off or even decrease slightly (by about 1%) in H2 of 2015. The US is the world’s largest market for machinery, as well as the third largest supplier. Domestic manufacturers share of the US domestic market amounts to nearly 60%. In 2014, the business environment for the machinery industry was quite favourable, as US industrial production grew by more than 5.0% year-on-year, including a 6.7% hike in manufacturing production and an 18.8% increase in mining production. However demand declined in Q1 of 2015, as industrial production decreased 1% year-on-year, due to weaknesses in the mining and utilities industries. However, the first quarter is traditionally a period of slower growth for machinery, and it is expected that demand will increase again in the coming months. Overall, it is expected that businesses´ profit margins will remain stable in 2015. However, volatility of raw material prices (steel) and energy prices (coal and oil) remain a concern. Most businesses in the US machinery sector are small and medium- sized enterprises (SME), but there are also many large publicly traded firms and iconic American brands that do business on a global scale. Usually those large companies easily obtain external liquidity. Large players like John Deere and Caterpillar each have captive finance entities to facilitate the purchases of their equipment. In general the dependency on bank financing of the capital-intensive machinery industry is high. US banks are principally willing to provide loans to the sector, and there are also other lenders such as Machinery Finance Resources (MFR), which have specialised in the financing the machinery industry. The average payment duration in the US machinery industry is 30 days, however, payment terms can be longer as capital equipment can carry a higher price tag. Payment experience over the last two years has been good, with a rather low number of non-payment cases, and it is expected that non-payment cases will decrease further, by about 5% in the coming six months. Compared to other US industries the rate of insolvencies is low in the machinery sector, and it is expected that business failures will level off or even decrease slightly (by about 1%) in H2 of 2015. As the machinery sector has fully recovered from the 2008/2009 recession, weaker players have already left the market during the crisis years. 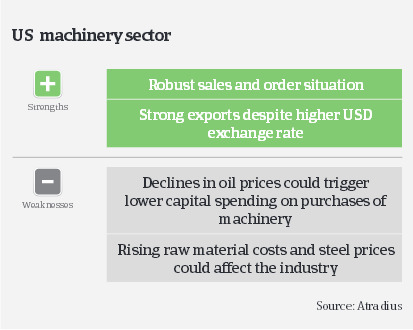 Due to the benign credit risk and good business performance our underwriting stance for the US machinery sector is generally open. Some caution is advised on the farm machinery subsector, which recorded double-digit decreasing sales in 2014, and on the important industrial machinery buyer sectors due to the effect of oil prices: a persistently declining oil price could force oil producing companies to curtail their drilling activities, and this may trigger lower capital spending on purchase of machinery and equipment. The US economy is expected to grow 3.1 % in 2015, while unemployment is expected to drop to 5.5 %. Together with improving consumer sentiment, those indicators support higher top-line sales growth.